Special blessings: Banyo Nundah parish pastoral council chair Jack Greathead holds the papal blessing for the community’s centenary milestone. He is pictured with his daughter Catherine. Photo: Mary McBride. NEIGHBOURS don’t get any more Catholic than in the Banyo Nundah parish. Built in the first free settlement in the penal colony of Brisbane, the now 100-year-old parish has acquired some of the holiest of neighbours both above and below the ground. Parish priest Fr Bernie Gallagher drew up this list of “intellectual properties” for a brief address at the parish’s centenary Mass on May 29. Among them is the Australian Catholic University and Holy Spirit Seminary, both based at Banyo, the Sisters of St Joseph’s convent which housed St Mary of the Cross MacKillop for some years, other large groups of religious, three Catholic schools and Nudgee Cemetery, Fr Gallagher’s “final resting place”. “I stand in the shoes of Monsignor Martin Jordan and Dean Patrick Brady of Banyo parish, who are both buried in Nudgee, along with their successors,” Fr Gallagher said. The past 100 years at Banyo Nundah has been marked by many changes, both within the parish and outside the walls. Brisbane Archbishop Mark Coleridge recalled the “paradoxical” history of the parish during his homily at the centenary Mass. Founded during the “horror” of the First World War in “the birthplace of Protestantism in Queensland”, Catholics found a light on the hill in the Nundah community. “It was founded in the midst of the horror of World War I; it then knew the influenza epidemic, the Great Depression, World War II and so on,” Archbishop Coleridge said. “In the midst of all the turmoil, this community of faith, gathered on Mount St Joseph, became an oasis of peace and encouragement in a world that badly needed both. Archbishop Coleridge reminded the congregation that the light of Christ had shone brightly in the parish for 100 years. “Here the light has shone which no darkness can dispel, and here it will shine as long as there are people of faith who gather here,” he said. Archbishop Coleridge presented three papal blessings to the Banyo Nundah community to mark the centenary of the parish, the Sisters of St Joseph convent and St Joseph’s School, Nundah. Following the Mass, parishioners joined in a multicultural party. 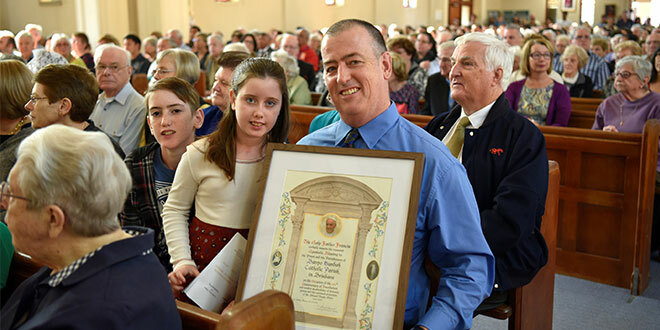 The parish’s centenary celebrations will continue through the year and will include the release of a history book.